(21816.32, Oklahoma Historical Society Photograph Collection, OHS). In Le Flore County, Cameron is located on State Highway 112, eight miles northeast of Poteau. In 1933 noted geologist Charles Gould speculated that the town may have been named for former Indian Territory Mine Inspector William Cameron. In the mid-1930s the Federal Writers' Project, using local residents as sources, claimed that the name honors James Cameron, who in 1886 did preliminary work for the railroad company that built through the area. By the time James Cameron came to this region of the Choctaw Nation, a small settlement of nearly forty people had already formed. The Fort Smith and Southern Railway laid tracks in the area in 1886–87, although the St. Louis and San Francisco Railway (SL&SF, or Frisco) bought the railroad in February 1887 and completed the line. In 1888 the Post Office Department established the Cameron post office, with William Green serving as postmaster. 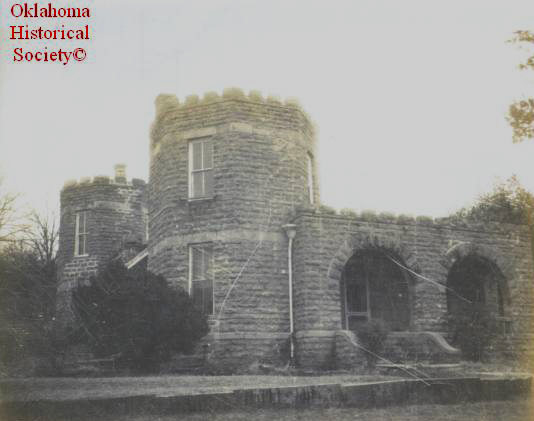 James Reynolds, a successful rancher and entrepreneur, moved to the community in 1890, building the town's most recognizable home, constructed in the form of a castle. It was listed in the National Register of Historic Places (NR 77001093) in 1977. In 1893 Reynolds established the Cameron Institute, sponsored by the Presbyterian Church and serving students of any denomination from the primary level to high school. The school continued into the early twentieth century. In 1895 the U.S. government divided Indian Territory into three judicial districts, with the central district conducting its courts at Atoka, Antlers, Cameron, and South McAlester. This selection made Cameron a growing, active town, and it applied for incorporation under Arkansas law in 1898 after the Curtis Act passed. By 1900 the population stood at 316. That year the federal government moved its court to nearby Poteau. In 1901 Cameron had a hotel, several retail stores, three doctors, three cotton gins, and a blacksmith. By 1910 the population had declined to 206, and in 1911 the businesses were a bank, five general stores, three doctors, a drugstore, one cotton gin, and a blacksmith. Cotton dominated the area's agriculture, but fruit and potato farmers also prospered. Coal mining existed on a limited basis, with the Williams Coal Company leasing a mine from the Cameron Coal and Mercantile Company in 1913. Strip mining occurred later in the twentieth century. In 1923 the first successful natural gas well was drilled near Cameron in the Cameron Field. Before the year ended, there were seven producing wells, and by 1930 there were ten. The 1930 population of 233 declined to 203 in 1940. In 1932 the town still supported a cotton gin and a cotton oil company. In the 1950s the Peerless Coal and Coke Company operated in the area. The population remained around two hundred until it rose to 311 in the 1970 census. In 1980 the Frisco abandoned its Le Flore County tracks. In that year the population reached 365, and it declined to 327 in 1990. Natural gas extraction continued at the end of the twentieth century. The Williams School (NR 88001408), built by the Works Progress Administration and situated northwest of Cameron, is listed in the National Register of Historic Places, as is the Jenson Railroad Tunnel (NR 76001567), northeast of the town. In 2000 there were 520 students enrolled in prekindergarten through high school, and the town's population was 312. The 2010 census counted 302 residents. Jeffrey Burton, Indian Territory and the United States, 1866–1906: Courts, Government, and the Movement for Oklahoma Statehood (Norman: University of Oklahoma Press, 1995). Rosa Ayleene Nance, "Captain James E. Reynolds," The Chronicles of Oklahoma 32 (Spring 1954). Henry L. Peck, The Proud Heritage of LeFlore County: A History of an Oklahoma County (Van Buren, Ark. : Press Argus, 1963). Sarah Singleton Spears, Yesterday Revisited: An Illustrated History of LeFlore County (Poteau, Okla.: Poteau Daily News and Sun, 1991). Larry O'Dell, "Cameron," The Encyclopedia of Oklahoma History and Culture, https://www.okhistory.org/publications/enc/entry.php?entry=CA018.